There was a time when the American watch industry was a fierce compeditor of the Swiss. Some believe this is once again the case, although now the Americans are armed with the Apple Watch. Personally, I think that for some, the Apple Watch might be an “add on” to their collection, but I am not convinced that for many it will replace their precious mechanical masterpieces. But that doesn’t mean the Swiss are out of the woods, because the American watch industry is getting back into shape, and at the forefront we find RGM. In many ways, RGM represents contemporary American watchmaking at its finest, renewing and continuing traditions that where largely wiped out by the quartz crisis. RGM is not only the future of American watchmaking, it also keeps alive the link with the past, especially with watches like the new 801-COE. 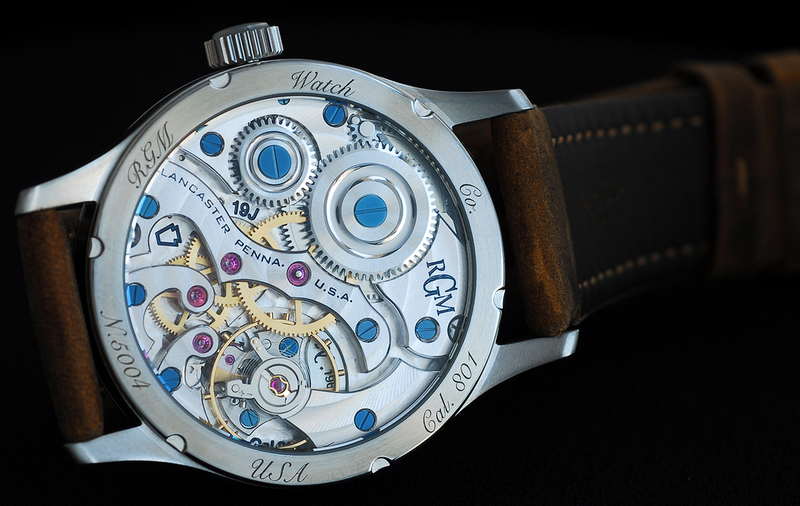 Crafted in-house by RGM, this watch is inspired by those worn by members of the U.S. Army Corps of Engineers (COE). 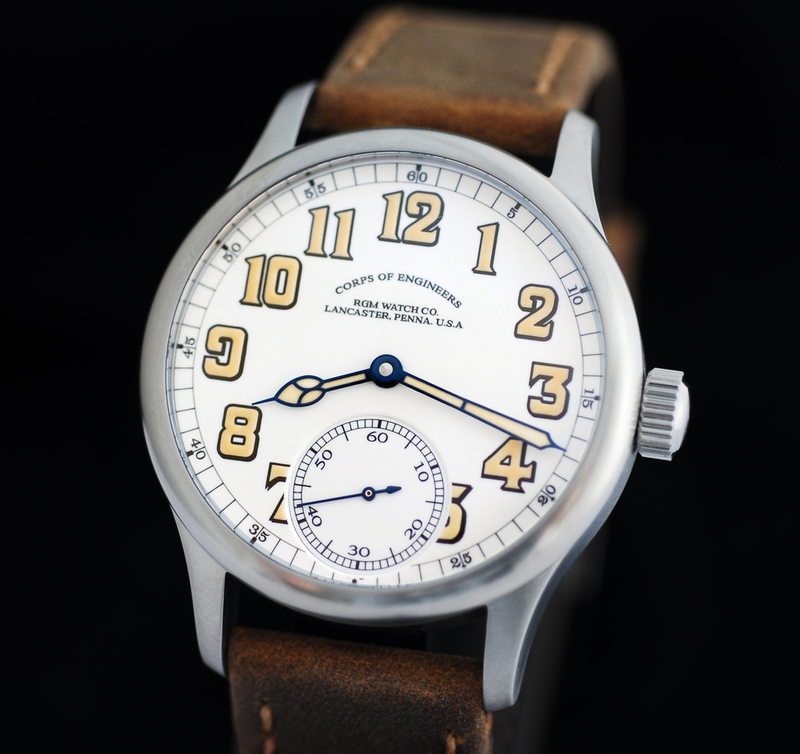 When they joined the French and British WWI forces in 1917, they did so wearing American-made Hamilton railroad watches. 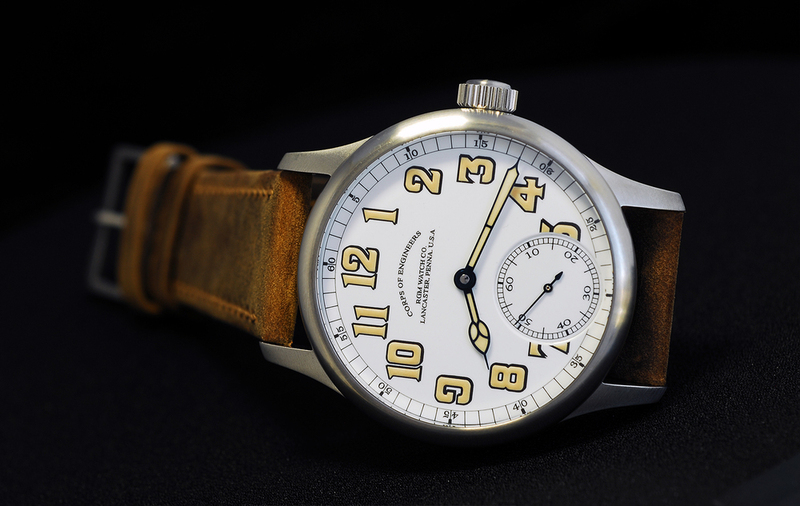 That was not a surprising choice, given that the COE had adopted the General Railroad Timepiece Standards of 1893. Beyond the aesthetic inspiration, the 801-COE offers another delight, which you might guess from its name – it’s fitted with RGM’s American 801 movement. Those familiar with American pocket watches know that the American watch industry has created some amazing looking, and reliable, hand-wound movements. The 801 fits right in with that legacy. Manual winding, with lushly shaped bridges, blued screws, and a generous diameter, it is a true feast for the eyes! Circular Cote de Geneve, perlage and lovely hand finishing place this movement squarely in the same ballpark as calibers created by famed Swiss maisons. Like the original timepiecews worn by the COE, this watch features a Grand Feu enamel dial. Regular REVOLUTION readers know we love this type of dial, and we appreciate the level of craftsmanship required to create it. 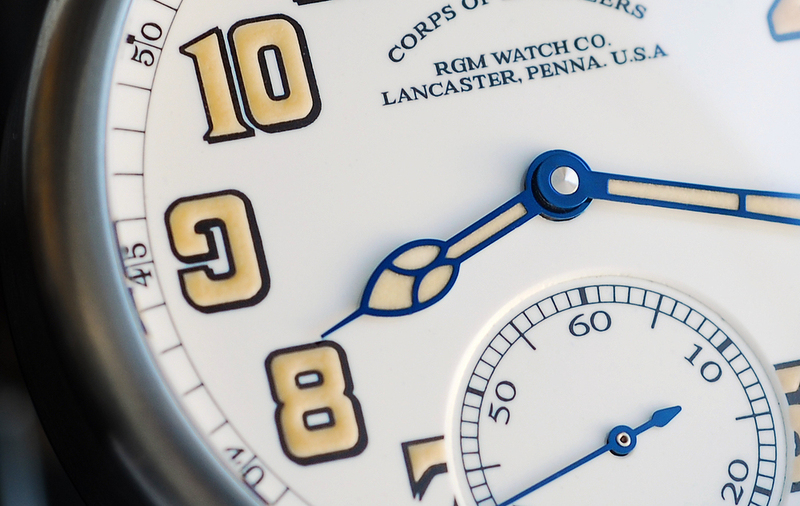 On this RGM, the dial’s glossy white look, combined with bold, faux-patinated SuperLuminova Arabic numerals and cathedral hands, give it a great vintage look. RGM offers the 801-COE on a steel bracelet, but on the available brown leather strap, it looks like it came straight out of the late 1910s. For this watch, there is no greater compliment. This timepiece is proof that RGM is preserving the traditions and craftsmanship of American watchmaking, to be passed on to future generations while being enjoyed by the current one!